Susan pretty much stole my thunder, but I’ll go ahead anyway and torture you with more about the Cape May Banding Project. Part of the fun in watching hawks is learning to identify them in the field. Most often we get only a fleeting glance that offers little more than a general impression of the bird’s size and shape, with little or no detail visible as it disappears into the distance. 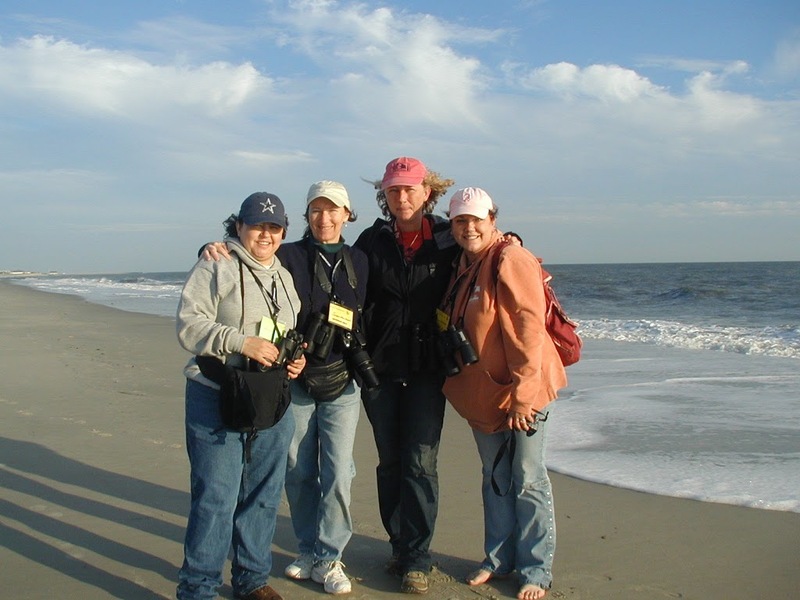 The banding demonstrations at Cape May Point State Park offer those of us who are drawn to birds of prey the chance to see some of those details up close. Birds of prey have become a popular study among birders and there are plenty of books to help with identifying them, but can’t compare to the thrill of seeing one up close. The point of the banding demonstrations is to engage the public and generate support for the project; the purpose of the banding itself is a bit more far-reaching and long-term. Last fall when I wrote a bit about the monarch tagging project, a commenter here questioned the ethics of tagging butterflies. I think the same criticism might be made for banding hawks if we fail to consider the importance of the science behind it. 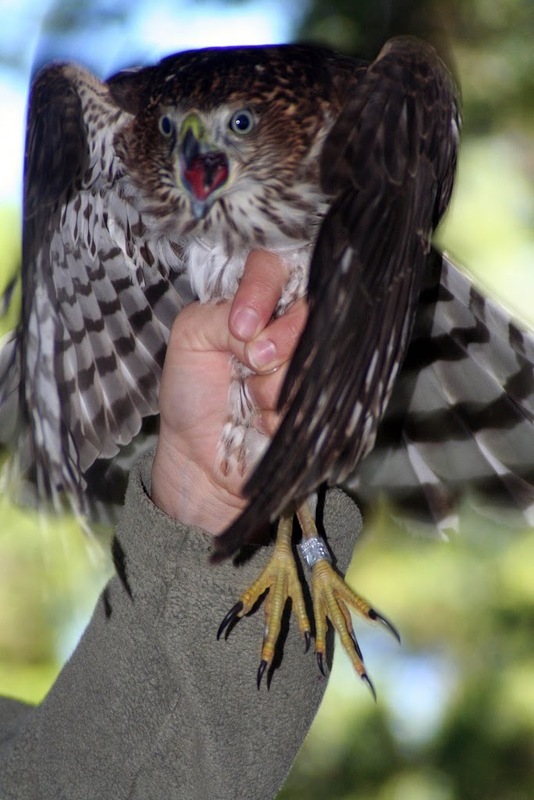 The capture of migrant hawks is routine at many hotspots throughout the world; Cape May isn’t unique in that respect, and the numbers banded through the years are quite large. The data gained can help to answer important questions about population dynamics and provide insight to understand why some species are in decline. The name Blue Darter is an old nickname for the Cooper’s Hawk and refers to the bluish-gray on an adult hawk’s back. This cranky one is a juvenille showing the typical brownish-streaked breast and belly. I felt about how this bird looks going back to work today until I found out that I had won $50 in the baseball pool for the World Series! Most important is the sea and a beach empty of people. Shorebirds wheel in the far distance trailing their shadows along the shoreline. The haze at the horizon suggests gannets or scoters tumbling into themselves above the breakers. Somewhere behind is the dune forest with its hollies and bayberries. 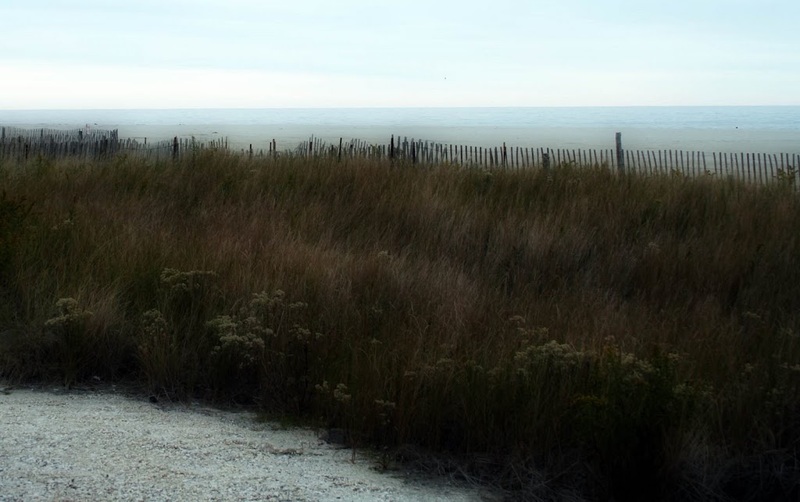 The autumn sun vaguely warms the chilly salt air; you wish for another layer but the car is too far off to go back. 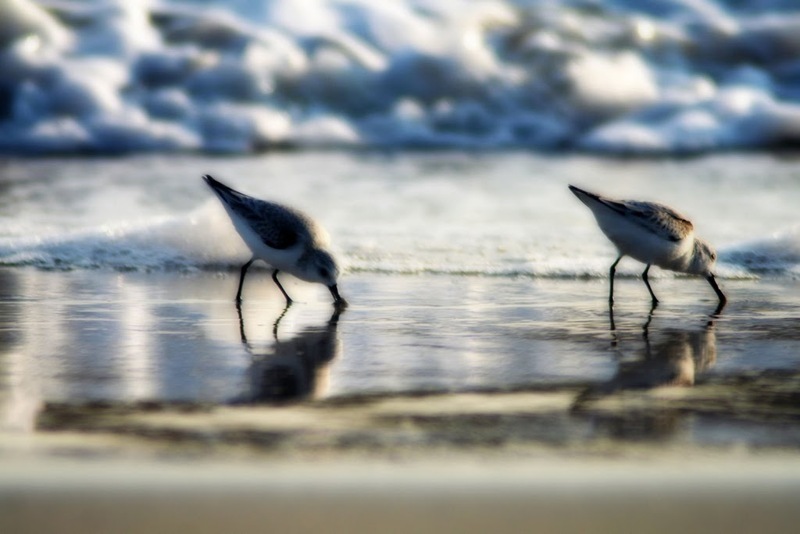 A walk along the shore is a sustaining ritual for many. The elemental beauty of the sea’s edge captivates the newcomer just as readily as it attaches itself to the memory of those of us who call it home. Someday soon I’ll be in the mood to share pics and tell stories, but for the moment I’m caught in that melancholy state of post-vacation-let-down. 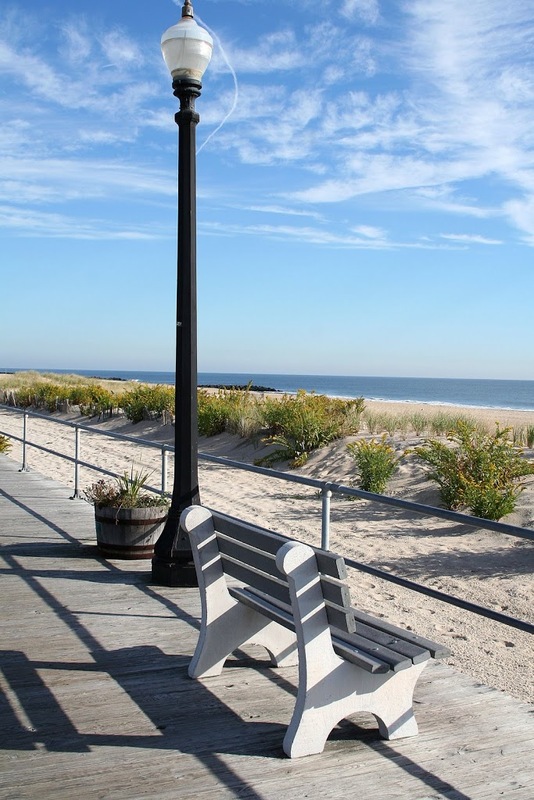 It isn’t easy explaining the *Cape May Experience* to someone who hasn’t been here. If you’ve gone to other birding festivals, you might have an inkling, but I doubt it’s comparable. The first time I came for an Autumn Weekend and then had to leave and go home, I was almost in tears for most of the long drive up the Parkway. Granted, I don’t get out much and was new to birding, but really, there’s something special about Cape May. I hope that Susan, Susan and Delia got an idea of that special something and can maybe convey it better than I with their posts about the weekend. It’s not just about the spectacle of bird migration that’s so obvious here. Part of it is that there are so many familiar faces and a sense of connection, even among strangers, and the easy way we find common ground to share a laugh, a story and the simple comfort of a warm car at dusk beside the hawkwatch. Please send some love Lynne’s way. Her mom passed away today. We’ve all arrived safely – a bit wet and bedraggled – but we’re here. The wireless connection at the hotel is painfully slow, but I wanted to share this less-than-stellar shot of the first bird that found me this afternoon. 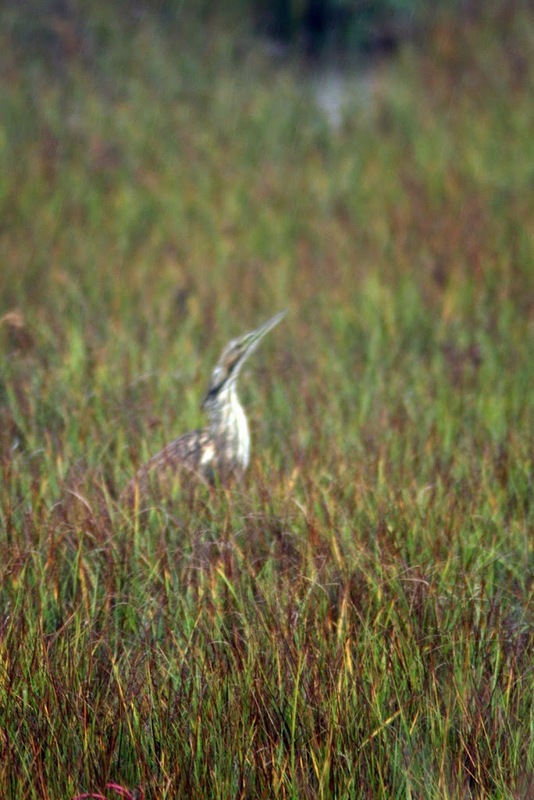 Now can someone tell me what variety of bittern this is, before I unpack the field guides? Thanks to everyone who took the time to send pics! We’ve made a lovely mosaic of fall color, don’t you think? 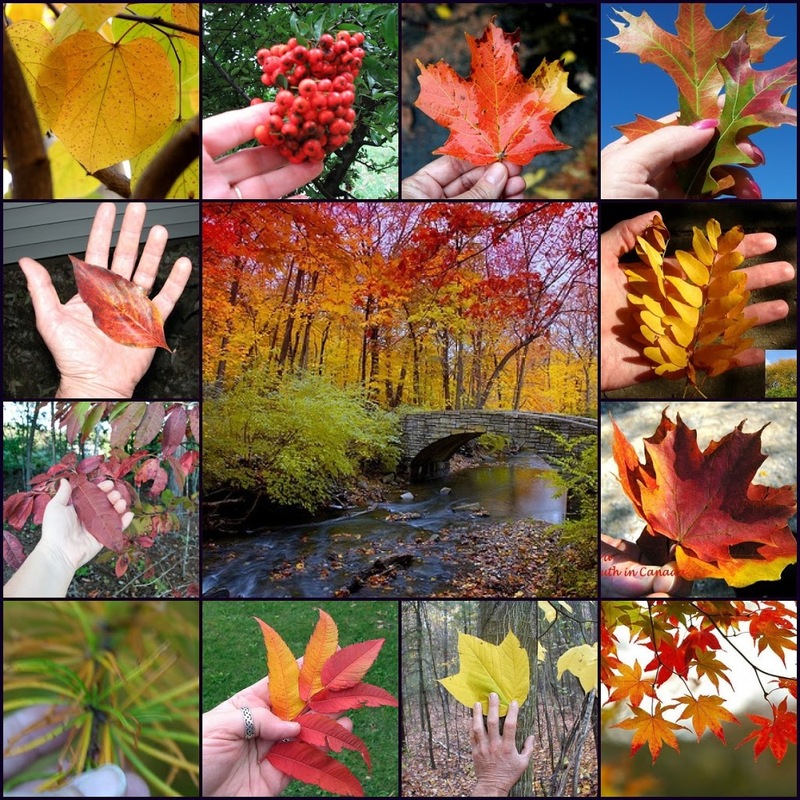 Hand and leaf ID’s are as follows (clockwise from top left): Redbud, I think (from the Net), Piracantha berries from Donna who doesn’t have much color yet, Maple from Nina, Pin Oak from Mary, Locust from John, Maple from Ruth, Maple leaves (from the Net), Striped Maple from Al (also called the Moosewood Maple or the Goosefoot Maple which I can totally see – thanks Mojoman – I learned a new ID with that name! ), Staghorn Sumac from Ruthie J., Larch needles from me, Sourwood from Jayne, and Dogwood from Larry. 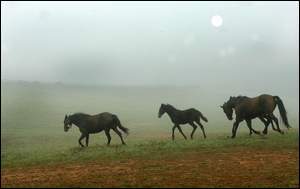 The Breeder’s Cup is coming to town, and if not for the Cape May Weekend, I’d be there! This is the first time the event has been held in NJ, and it’s practically in my backyard, but I’m gonna miss it. I’ve never been to a horse race in my life and would probably hate it. But I’d still love the chance to go and see the horses and be a part of the excitement. It’s warm here at the Jersey Shore! I snapped this pic around 10 am this morning at Ocean Grove (that’s Asbury Park in the distance) – this lady had the perfect spot on the beach for her workout. 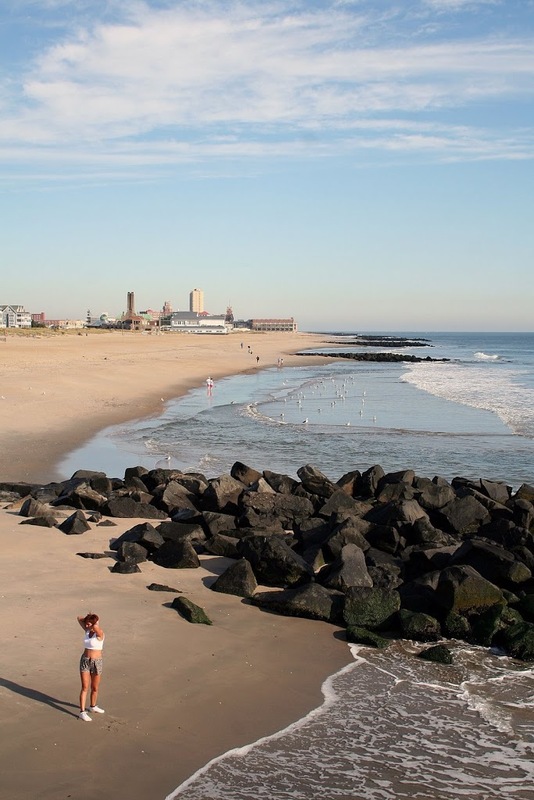 The locals all know that September is THE month for perfect beach weather without the crowds, but late October? The sky is that perfect shade of blue and it’s just warm enough for a nice nap in the sun. One nice thing about my new job is that I have *field days* when I have to make home visits. I don’t much enjoy poking around in client’s homes, but I do really like the chance to be out of the office a few days a week. In between appointments this morning I took a walk on the boardwalk and enjoyed the warm breezes with Monarchs floating along the dunes. What a beautiful day it was. The rugosa roses are still blooming and I was tempted to pick a bag of rose hips for jelly. 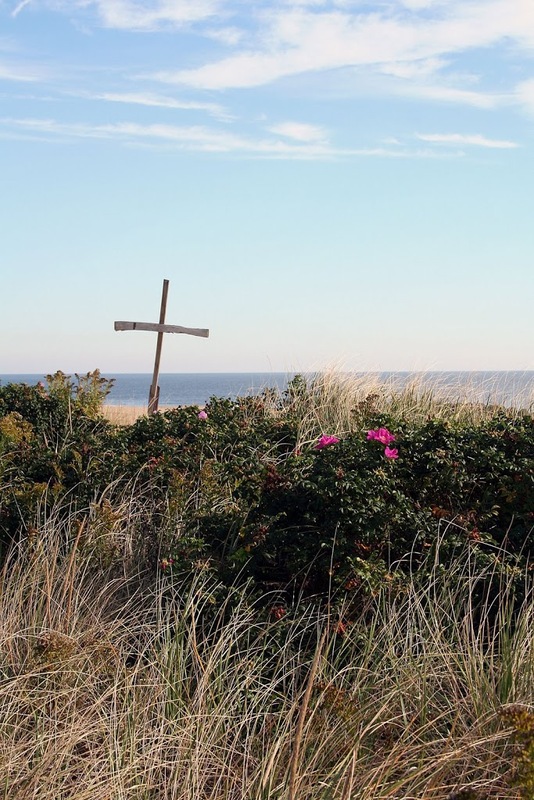 Ocean Grove has a long history as a religious camp town and Sunday services are still held in a little pavilion on the beach with a view of the dunes and the sea. The people at Barnes and Noble must love me. I think they dig out the oldest and least-likely-to-sell books and pile them up in a pretty seasonal display in some far off corner of the store just hoping for someone like me to wander by. I zoom past the popular fiction-of-the-moment and go right for the dorky nature books. This little book is my latest find and it’s been getting a fair amount of use for the last week or so. It has nice pics of leaves, berries, and nuts to help me know what I’m seeing out in the woods. I’m not very good with trees and thought the fall color or seeds of certain trees might give away their identity more easily now than in the summer when everything is just so much green.